Tehiyah Day School is proud to introduce an annual $10,000 scholarship to new middle school students in good academic standing who demonstrate a knowledge and commitment to our school’s midot (character/values), including: Communal Responsibility, Acts of Loving Kindness, Gratitude, Hope, Stewardship, Sanctity, Righteous Justice, Courage, Leadership, and Solidarity. This scholarship was created in memory of Shira Ulmer (nee Riff), an alumna whose deep commitment to the Tehiyah community and her friends inspired those around her to be kind and just. 5th, 6th and 7th graders not currently enrolled at Tehiyah who are in good academic standing. Students must apply and be admitted to Tehiyah Day School in order to be eligible for the scholarship. Students must complete the online scholarship application and produce a creative demonstration of one of our school’s values. This can take the form of a written work, performance, artistic creation, or any other creative product. All applications and creative demonstrations are due to the admissions office by Thursday, February 15th. HOW MANY RECIPIENTS WILL BE AWARDED THE SHIRA LEGACY SCHOLARSHIP AND WHAT IS THE VALUE? 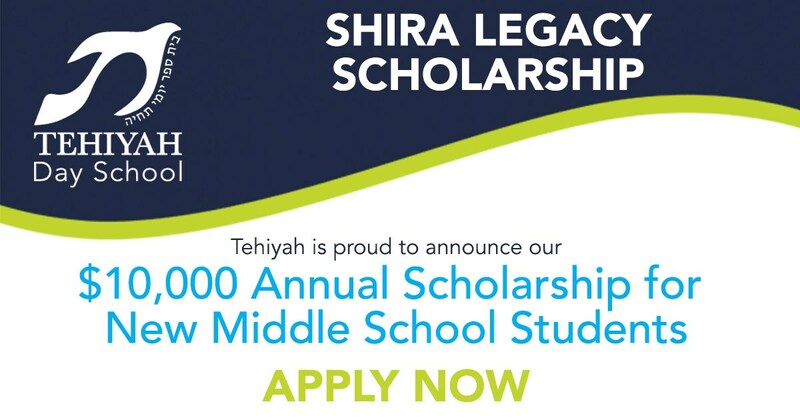 Any student who completes the full admissions process, is admitted to Tehiyah AND submits the scholarship application and creative demonstration of our values will receive a Shira Legacy Scholarship. There is no limit to the number of scholarship recipients each fall. The scholarship is renewed annually for the entire length of matriculation in the middle school program at Tehiyah. To renew the scholarship, a student must maintain continuous full-time enrollment at Tehiyah and maintain good academic standing. CAN I APPLY FOR ADDITIONAL FINANCIAL AID? Applicants are eligible to apply for further financial aid. If you wish to pursue needs-based assistance, parents must submit an online Parent Financial Statement (PFS) by February 15, 2018 at SSS:http://sssbynais.org. When prompted, please enter the Tehiyah code, which is 7627. Submit the Tehiyah Day School application. Submit a current transcript including the most updated report card. Complete and file the online scholarship application. Contact Maureen Krantz, Director of Admissions, at (510)233-3013 x7102 or mkrantz@tehiyah.org.